Much has been made about Mitt Romney’s tax returns. Reviewing them clarifies both public policy and personal wealth management. The Romneys’ 2011 adjusted gross income (AGI) was about $13.7 million. Their total federal income tax due was about $1.9 million. A quick calculation assumes their overall tax rate was 14.1%. But this number is highly misleading. The average person might assume the Romneys were able to keep 85.9% of everything they earned, which is simply not true. Let’s see how much the couple really kept for themselves. After establishing AGI, there are a number of below-the-line deductions. The Romneys had $4.6 million in itemized deductions. They paid $1.3 million in state and local income taxes and $215,000 in real estate taxes. If we had a flat tax, provisions would not be required to prevent taxing money paid in taxes. Historically, this deduction prevents progressive tax rates from approaching or exceeding 100%. Because these amounts represent money the Romneys never saw, I am adding them back into what was lost along with the taxes they paid. The Romneys were extremely generous, donating $1.3 million in cash and another $921,000 in securities. In a flat-tax system, these deductions would not be as critical as they are given our highly progressive system. If they were considered income with no corresponding deduction, people with the highest income would not be able to be generous. Their income would push them into a tax bracket where they could not afford it. Giving $2.3 million to charity certainly should not be the basis of any criticism. It is money the Romneys did not keep for themselves, so I am counting it with the money lost in taxes. 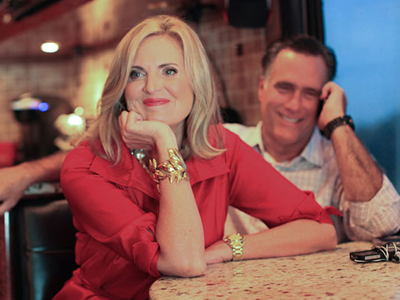 The Romneys received $2.2 million in qualified dividends and an additional $6.8 million in capital gains. Both of these receive favorable treatment and are only taxed at 15%. Many have suggested this is too low and should be the same rate as tax on ordinary income. This reasoning is faulty because this money is taxed at the corporation before it can be paid out in dividends. For example, if a company in the highest corporate tax bracket earns $100 of profit, it must pay $35 in corporate profits before paying a dividend. The $65 paid as a dividend is then taxed a second time at the 15% rate. Of the $100 in profit, the stockholder only receives $55. Complaining the 15% rate is too low ignores the cumulative tax rate of 45%. To compute the Romneys’ effective rate, we would have to add the $35 of corporate tax paid to both the Romneys’ income and tax paid. The correct tax rate for dividends and capital gains is zero because they have already been taxed at the corporate level. So the Romneys have already paid more than their fair share of tax there. Using this estimate these earnings already paid an additional $4.9 million in corporate taxes, money that never flowed into their AGI in the first place. To be fair, we should add it to their AGI as well as the tax they paid. Finally, the Romneys paid $103,000 in foreign taxes, which has nothing to do with offshore accounts. It concerns global investments. President Obama paid $27,000 in foreign taxes. If you have any allocation to foreign companies in your portfolio, you probably paid foreign taxes as well. If you held those investments in a taxable account, you can deduct these amounts. These deductions avoid marginal tax rates exceeding 100% in a highly progressive system. With these adjustments, the Romneys’ tax return tells a very different story. After $18.6 million of productivity, they paid $10.8 million in taxes and gifts to charity, keeping just 42.1% of what they produced. The liberal media has focused on federal income tax owed as only 14.1% of the Romneys’ federal income. Yet their outgo of taxes and gifts to charity were about 57.9% of their productivity. In a similar analysis of the Romneys’ 2010 tax return, they paid $15.6 million in taxes and gifts to charity on $30.2 million of productivity. Again, they kept less than half of what they had earned. Their generosity and tax burden is hardly the example of greed that advocates of greater government would have us believe. And because it doesn’t fit their narrative, they purposely distort it. Romney’s tax returns a stellar example of citizenship and generosity. you for presenting this information. Democratic presidential candidate Barack Obama and his wife Michelle gave $10,772 of the $1.2 million they earned from 2000 through 2004 to charities, or less than 1 percent, according to tax returns for those years released by his campaign. The Obamas have since gradually increased their giving after having made their tax returns public. Wait a minute, not to suggest you’re a partisan hack, but…. What about other taxes they paid? What about any investment return? Are we gonna consider the 35% the company paid before giving capital gains to the Obama’s? Man, this is the best! Chris, your mean-spiritedness is evident. Yes, corporate taxes paid before the payment of dividends or capital gains ought to be considered taxes paid regardless of if the individual is a Republican or a Democrat. As one who leans Libertarian I defend the moral case for free enterprise. That includes Bourbon Democrats as well as the Romneys. The Romney’s generosity and tax burden is hardly the example of greed that advocates of greater government would have us believe. I defend them for the same reason I would defend the right to free speech of someone regardless of what they had said. I get clients by helping small business owners with comprehensive wealth management which, among other things, helps them overcome the burden of a highly progressive tax system and put their money where it will never be taxed again. “we’ve given all you people need to know” Ann Romney 7/19/12 But have they? This is the critical question: Did the Romneys get amnesty from the IRS in 2009? To my knowledge, the Romneys have not been directly asked this question. 1. Romneys had a Swiss bank account in 2009. 3. UBS, after being fined $780,000,000 by the IRS for conspiring with its depositors’ to conceal taxable income, released to IRS the names of 4,700 Americans with UBS accounts. 4. IRS offered amnesty to Americans with unreported foreign bank accounts in March 2009. 5. In 2009 IRS received approximately 30,000 requests for amnesty from Americans with foreign bank accounts. 6. The penalties for foreign account tax evaders who failed to obtain amnesty were draconian. 7.Those who received amnesty were given immunity from criminal prosecution. 8.The Romneys have not released, for any year, their FBAR Forms which provide detailed information to the IRS regarding foreign bank accounts. FBAR is the acronym for Report of Foreign Bank And Financial Accounts form (TD F 90-22.1). 1. Whether the Romneys asked for amnesty. 2. Whether there is any other compelling reason for refusal by Romneys to produce the 2007, 2008 and 2009 tax returns and their FBAR Forms. 3. Why Romneys opened UBS account. 3. Why Romneys closed UBS account after UBS was caught. *”Amnesty” by the IRS is given to persons who have committed crimes, confess and agree to certain penalties in exchange for immunity from criminal prosecution. Conviction for tax fraud is punishable a fine of up to $100,000 and up to five (5) years in prison. These penalties are in addition to the civil penalties. P.S. Since when do gifts to charities count as taxes? Slander like this is why I wrote the article in the first place. The smear campaign against the Romneys over their tax returns is disgraceful. With no evidence but your own ill will toward the productive you sling your accusations. You should be ashamed of yourself. You wrote, “If the Romneys paid an unreasonably low rate of taxes on their substantial income, that shows that the law is bad.” But the whole point of my article was that they did NOT pay an unreasonably low rate of taxes on their income. In truth we ought to allow candidates some right of privacy in their financial affairs. If we taxed charitable giving then someone who gave all their money away would have nothing left to pay the substantial taxes you would assess. We tax only what people try to keep. This is why it is better to look at how much they did not keep. No, your article is about how you can decide what is a tax and what should and shouldn’t be, you can make it look like the Romney’s paid a much higher rate. The Romney’s paid their taxes and broke no laws. Tripe like this just makes it look worse. Chris, I made it very clear how much of my analysis was taxes, guestimate of corporate taxes, and charitable giving. Imagine two citizens. The first slaves to create $1 million in productivity. Keeping just $50,000 to live, they give everything else to their favorite charity, Habitat for Humanity. The second person creates just $100,000 and keeps it all for themselves. Who do you think should pay more in tax? Normally the 2012 tax on $50,000 of taxable income would be $6,630 and the tax on $100,000 of taxable income would be $17,060. It sounds like you favor punishing the generous person by taxing their charitable giving as though they had tried to keep is as income. Please, let me know how much you think they should be taxed having earned $1 million and given all but $50,000 to charity. Just to be clear, had these two individuals been running for President the press would be reporting that the generous person has a tax rate of 0.7% and the stingy candidate paid a full 17.1%. This is because charitable giving add to (B) without changing (A). Personally I think it is a mistake to value supporting the government (taxes) higher than supporting society (charitable giving). So I added giving and taxes together. Given the repetition of the highly misleading 14.1% number I can’t see how you would call a more complete analysis ‘tripe.’ My analysis is neither false nor misleading. Even if you just take taxes paid (removing charitable giving) you have $8,500,763 in taxes paid divided by $13,709,608 in total income for a percentage of %62. It would be an even greater percentage of taxable income. And none of this takes into account the $1.8 million in donations the Romneys purposefully left off their tax return. First of all, thank you so much for the common sense piece on the real effective tax rate paid by the Romneys. How frustrating that the media focuses on the 14%, without any acknowledgement of what is really going on. I think you may have still understated the Romneys’ tax rate, however. I have always thought that the “tax free” label given to municipal bonds is misleading. Indeed, muni bonds are exempt from federal income tax. But, of course, for this benefit the investor accepts a lower interest rate, effectively subsidizing local and municipal governments by lowering their borrowing costs. So, while not taxed at the federal level, muni bonds are very much “taxed” in that a lower than (taxable equivalent) market return is received by the investor, and local government is the beneficiary of this discrepancy. It would be very interesting to see the Romneys’ tax rate grossed up by the effective tax paid on muni bond income. Interesting, I made a comment yesterday that pointed out obvious errors in Mr. Marotta’s “article” and now that comment has disappeared. I guess someone fears criticism and/or correction. I asked Mr. Marotta if he owned a calculator, since “A quick calculation …” using his figures ($1.9 mil/$18.6 mil) actually equalled 10.2%, not the 14.1% in his article. Ummm … NO. Capital gains are NOT “…taxed at the corporate level.” Buy low, sell high, get capital gains. Nothing to do with corporate taxation. Plus, he assumes the MAX. corporate tax rate of 35% for all of the Romneys’ dividends, with no basis for doing so besides an assumption. Completely ignores effective tax rates for corporations, then EQUATES CAPITAL GAINS WITH DIVIDENDS. Capital gains are NOT the same as dividends, and have no corresponding corporate taxes to reverse engineer. So this is how he gets his $18.6 million AGI figure above: Actual AGI of $13.7 million, plus the fictitious $4.9 million of reverse engineered invalid AGI that he made up, to come up with the $18.6 million fictitious made up number he uses as AGI in his argument. And you are a Forbes contributor as well, for goodness sake. Fess up, and publicly. Be sure to give notice to all that your “article” has changed, on every site it had spread to prior to your correction. I get weary of the mean-spirited knife fights from the left against libertarians, your last one included. It is as though Romney must be guilty of greed and avarice simply because he is productive. Given the lack of generosity shown by left leaning candidates it is wearisome. I reserve the right to delete any comments I don’t want to give the time of day. The things that big-government liberals attack Romney on are the points that Libertarians like him best. His tax return is a stellar example of of citizenship and generosity. I posted my numbers here before I posted this article so that everyone could see where I was getting the number from and where the guesstimate was. I specifically linked to it so that people could take different numerators and denominators, and my first draft of the column had several of these in the opening paragraph. In cleaning these up I made it look worse for Romney by adding the guesstimate of corporate income without adding anything to his tax payments. I corrected that error. Imagine two companies which each have a profit of $15.38 per share. The first company pays a corporate tax of $5.38 per share (35%) and then pays a $10 per share dividend. The second company pays a corporate tax of $5.38 per share (35%) and then does NOT pay any dividend. What happens if the second company retains the earnings and does not pay a dividend? The answer is that the second company’s stock price rises (on average) by $10 per share as the book value of the company looks $10 per share better. It isn’t guaranteed, but that is what happens on average. There is little difference between a company that pays dividends and a company that retains its earnings. There are other things that the second company can do with the earnings which can also cause the share price to go up, on average by $10 per share after paying taxes. The second company can buy a small company. Their investment is the company’s cost basis. This must be capitalized, meaning it can’t be expensed. That means they must buy the second company with after tax dollars. They could also buy new store locations. Again this cannot be expenses, it must be capitalized. So in these examples, you are incorrect. Capital gains are like dividends in that they can be due to retained earnings after paying taxes at the corporate rate. David, Thank you for this informative breakdown. There are a couple issues however that I feel require clarity. I believe there is a small error in argument here. If you include the company’s corporate tax in Romney’s taxed amount, you must also include the company’s income. As you mention in another of your articles, corporate taxes are realized by employees, shareholders and the buyer/consumer. Ct = Et+St+Bt, so Ct cannot equal St, unless E and C are 0 (which is certainly not true). This is an important distinction. The corporation’s profit is not necessarily equivalent to the dividends received by the shareholders. Another crucial distinction I must mention is that gifts to charity are not the same as taxes. While taxes do in part go to social services, they also go to towards activities that serve corporate interests. The general populace is the beneficiary of taxes (at least theoretically). The beneficiaries of gifts are highly specific, however. Let us not ignore that there is also a personal benefit to charitable giving, whereas this benefit is not conferred by taxation. In fact, we know that taxation is offset by charitable giving, and not in a linear fashion. Readers, we all have inherent biases in our thinking. Rather than an approach that is designed to promote an emotional response intended to polarize, an educational approach is more effective. If you believe the media is making omissions don’t attack the media, speak back, talk to liberals. Likewise, there is no reason to attack Mr. Marotta, who kindly provided a very detailed financial analysis. There will be rational types and emotional types within any particular camp. We must trust that we have a common goal in our common citizenship, and speak as if we wish to be heard. Otherwise we all metaphorically are running around with our fingers in our own ears and the camp who ‘wins’ is the one with the most adrenaline. (1) You are correct as I wrote in “Who Pays Corporate Taxes” that corporate taxes are born by employees, shareholders and the consumer. But you are not correct that I am assuming that employee and consumers are not bearing any of the burden. Imagine a corporation in an industry where shareholders are seeking an 5% return on their investment. The share price is trading at $100 a share. The corporation is going to try to get $7.69 per share in profit so that after paying a 35% corporate tax rate they have $5.00 per share to pay a dividend or reinvest for capital gains. (3) They could pay a dividend greater than $5.00 per share. I written this before, but if a corporation has a profit of $7.69 per share and pays $2.69 (35%) in corporate taxes it will have $5.00 per share remaining. It can pay a $5 per share dividend or it can use the money for capital investments and hope that the share prices rises by $5 per share in unrealized capital gains. At some point when the stock is sold and those gains are realized the $5 gain is exactly equivalent to the dividend which could have been paid immediately. Capital investments such as buying a company or purchasing a new store location can’t be expensed. As a result businesses have to grow their companies with after tax dollars. This is especially true for small businesses whose profit flows onto their personal tax returns. The confusion comes because investors of stocks without dividends don’t realize that much of the growth of their company’s stock (apart from the market noise) is because of these capital after tax improvements. At any rate, the difficulty with the media’s calculation which comes up with the 14.1% level is that it adds this as income without counting *any* of the tax already paid. If you count all of one you should count all of the other. The same thing is true of charitable gifts. If I work hard and create $1 million in productivity, giving everything to charity except $50,000, the media would report my tax rate is only 0.7%. I think it is misleading to divide *federal* tax paid by *total* income without looking at any of the other taxes or adjustments. I written this before, but personally I think it is a mistake to value supporting the government (taxes) higher than supporting society (charitable giving). I have a quick question. It looks like you are calculating the effective corporate tax rate on the qualified dividends from the Romney’s tax return (which are $2.22 million). But why are you only including qualified dividends? Even though ordinary dividends are taxed at a higher rate, aren’t they still subject to the same corporate taxes? Unless I’m misunderstanding something, it looks like their tax return shows total dividends of $3.65 million. So, if we calculate the corporate tax rate on all dividends wouldn’t that make their effective tax rate even higher than what you calculated? AlsoWik, Ordinary dividends [line 9a] on the Romney’s 2011 1040 were $3,649,567. This amount is added to make their total income of $13,709,608. It is also taxed at their full 35% tax rate, so it is already computed into their effective tax rate. So, is it safe to assume that non-qualified dividends are generally not pre-taxed at the corporate level? Alsowik, I see what you are saying. There may be additional taxes I did not compute regarding non-qualified dividends which are taxed first at the corporate level. These would add to the Romneys over all tax burden, so you are correct, it would make their effect tax rate even higher. You can see how even a simple questions of how much taxes did the Romneys pay is very difficult to add up. Yes. Thanks for the response. I have one other question. Do we know the source of the Romneys’ capital gains income? Obviously if it were mostly from something like real estate, then the 35% corporate pre-tax wouldn’t apply. I would think most of it was from the sale of corporate stock, but I can’t find any good info on this. We don’t know the details of Romney’s capital gains, but regardless there isn’t a good reason to tax it. The correct rate for capital gains tax is zero. Most of the appreciation on real estate is just inflation. For government to charge a tax on inflation that they are responsible for by note giving us a currency which holds its purchasing power is ridiculous. Good point. I agree with you about inflation. I’m trying to explain all of this to some other people so I’m just trying to anticipate objections. Just now reading this article (having only recently learned of your blog). I realize your example of the person who gives almost all of their income to charity is a caricature to illustrate a point, but it makes me ponder the opposite point you are making. Why are charitable contributions deductible at all? I suppose the libertarian view would be that it allows the capital to be allocated in the private sector rather than the government… but that argument is not unique to charities. By providing a tax deduction for charitable giving, this feature of the tax system allows me to decide (effectively) that I don’t want any of my income to support, for example, national defense, instead it should nearly all go to some organization that is trying to preserve the habitat of horned owls or some such thing. This just strikes me wrong; if taxes are meant to support the common good this result does not make sense. That said, my comment can be seen as an argument for a simple low tax with no deductions, or a consumption tax, or probably other tax regimes. It isn’t meant to provide support for the current income tax regime, but as long as we are in the current system, let’s at least try to keep it free from distortions like this. Enjoy your columns, even if I don’t always agree!